A landing gear malfunction that caused a small commercial spacecraft to skid off the runway after its first unmanned flight Saturday caused relatively minor damage and an official with builder Sierra Nevada said Tuesday the test confirmed the flight worthiness of the winged "lifting body" design. An image of the Dream Chaser just before touchdown Saturday. Credit: Sierra Nevada Corp.
"Ninety-nine percent of the flight that we really wanted to get, which was does this vehicle fly, is it able to be controlled, does the software work, can it autonomously fly the vehicle in, can we acquire the runway and land, all of that was 100 percent successful," said Mark Sirangelo, corporate vice president of Sierra Nevada. "In fact, we probably performed better than the original test standards were meant to do." At this point, engineers are still assessing the damage endured by the "Dream Chaser" test vehicle as well as flight data characterizing the spacecraft's aerodynamic performance. 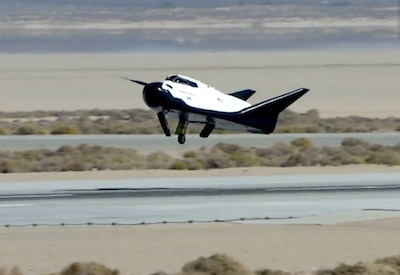 Depending on the result, the company may opt to repair the test craft for additional unmanned test flights or to press ahead with plans for manned landing tests next year. "We don't think it's actually going to set us back," Sirangelo told reporters in a teleconference. "In some interesting way, it might actually accelerate it. Because if we've got all the data we needed to get, and it's still early, but if we were able to get all the flight data we were expecting to get, we might actually have been able o bring the vehicle back earlier and get it ready for its next flight. "We're going through that now, but we don't think there is going to be any signifiant delay to the program as a result of this. This was meant to be a test vehicle with a limited number of flights." Sierra Nevada's Dream Chaser is one of three spacecraft under development as commercial candidates to ferry astronauts to and from the International Space Station, ending NASA's reliance on Russian Soyuz rockets. The other competitors holding NASA development contracts are Boeing and Space Exploration Technologies. Boeing and SpaceX are developing capsules that would return to Earth under parachutes for landings at sea or on the ground while Sierra Nevada is focused on a winged lifting body modeled after a NASA design that was tested but never built. Unlike its competitors, the Dream Chaser is designed to glide to a runway landing at the end of each mission. During its initial unmanned free flight Saturday, an engineering test model of the Dream Chaser was hauled up to an altitude of around 12,500 feet above Edwards Air Force Base, Calif., by an Erickson Air-Crane helicopter. It then was released for an autonomous one-minute glide to landing. Moments after release, the spacecraft executed a steep, 50-degree dive before lining up on the designated runway, flaring and slowing to its planned touchdown velocity of around 160 knots. "The summary of the flight was a perfect release, perfect dive, pull-out of the dive, commands (were executed) at exactly where the flight software and predictive models wanted it to be, the approach to Edwards was uneventful," Sirangelo said. After lining up on the runway, the spacecraft's nose landing skid and right main landing gear deployed normally about 200 feet off the ground. But the left main gear hung up for some reason. Sirangelo said the software issued the proper commands, leading engineers to suspect a mechanical problem of some sort. In any case, the Dream Chaser's flight software responded to the unbalanced load at touchdown, keeping the spacecraft's left wing off the ground as long as possible. But it eventually came down and the craft skidded off the runway in a cloud of dust. Sierra Nevada released a video of the landing test, but it stops just short of touchdown and the runway skid is not seen. Sirangelo said dust obscured the view, but the spacecraft was found right side up and engineers do not believe it flipped over. "The vehicle was damaged on its skid and roll off of the runway, but we believe it to be repairable and flyable again," Sirangelo said. A post-landing inspection revealed the crew compartment was undamaged and Sirangelo said had the flight been manned, no one would have been injured. Going into the test, Sierra Nevada tentatively planned one more unmanned approach-and-landing test, a manned ALT next year, an unmanned orbital demonstration flight in 2016 and a manned orbital test flight in mid to late 2017. But that schedule assumes Sierra Nevada wins downstream contracts to continue the Dream Chaser's development. Before the space shuttle's retirement in 2011, NASA began awarding contracts intended to spur development of commercial manned spacecraft to ferry astronauts to and from the International Space Station. The goal was to end the agency's reliance on Russia's Soyuz spacecraft, at more than $60 million a seat, and to encourage development of a private sector manned space industry. On Aug. 3, 2012, NASA selected Boeing, SpaceX and Sierra Nevada for funding to continue development in a third round of Commercial Crew Program contracts. Unlike the earlier design studies, the Commercial Crew Integrated Capability Initiative -- CCiCap -- contracts require each company to develop an integrated solution that includes ground infrastructure, launch vehicles and spacecraft. SpaceX was awarded a $440 million contract to continue development of a manned version of the company's Dragon cargo ship, which is currently flying unmanned cargo flights to the space station. The SpaceX manned capsule will seat up to seven astronauts and rely on an upgraded version of the company's Falcon 9 rocket to reach orbit. Initial test flights could come as early as 2015, depending on funding and engineering progress. Boeing won a contract valued at $460 million to develop its CST-100 capsule. The spacecraft will seat up to seven astronauts and fly atop a United Launch Alliance Atlas 5 rocket. The CST-100 would make a parachute descent to a ground landing. Barring technical problems or budget issues, the first manned test flight is expected in 2016. Sierra Nevada was awarded a $212.5 million control to continue developing the Dream Chaser. The spacecraft is designed to seat seven and launch stop an Atlas 5 rocket. The CCiCap contracts are expected to run through May 31, 2014. After that, NASA presumably will select one, or possibly two, companies to continue development of actual spacecraft. While manned test flights could begin as early as 2015, agency officials say operational NASA flights to and from the space station will not begin until at least 2017 because of previous budget shortfalls.